Jordan Cove project manager Bob Braddock discusses the company's plans during a tour of the North Spit site in March 2012, shortly after tossing its application to become an LNG import terminal for a new opportunity: exports. Protesters stand outside the North Bend Community Center before a meeting with Jordan Cove last summer where Simpson Heights residents asked questions concerning project's workforce housing camp. 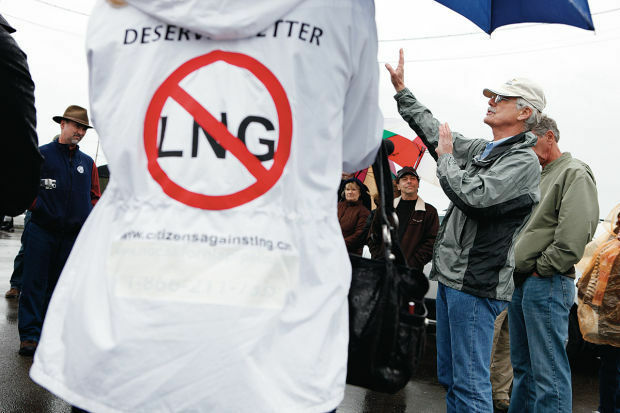 Anti-LNG and Boost Southwest Oregon members crowd FERC's December hearing regarding Jordan Cove. In this 2015 file photo, Jordan Cove’s parent, Canadian energy company Veresen Inc., illustrates the proposed liquefied natural gas liquefaction facility and terminal on Coos Bay’s North Spit. U.S. Sen. Ron Wyden takes a question from a Jordan Cove supporter at a town hall meeting last summer. COOS BAY — While Coos Bay waits for Jordan Cove to get the green light or the ax, there's a larger dilemma hanging over the United States' energy industry: How will the U.S. shale boom impact LNG prices and supply on a global scale, and what if export terminals are doomed before they're even built? The U.S. Energy Information Administration says the nation's shale gas plays will continue to produce enough natural gas to meet American need and provide sufficient supply for export through 2040 and beyond. Veresen Inc., Jordan Cove's parent company based in Calgary, Alberta, holds the same foresight. "I get asked a lot nowadays if the low crude (oil) prices will have an impact on our project," said Veresen president and CEO Don Althoff. "I don't believe it will. I believe our buyers take a long-term view of the marketplace. There's a four-year construction cycle and a 20-year contract. Buyers are thinking about 25 years out, really, when they think about pricing." But several industry experts are more pessimistic. The United States' rush to join the natural gas party began with a tragedy overseas: Japan's Fukushima Daiichi nuclear disaster in March 2011. “Afterward, Japan said, 'OK, we're done,'” said Art Berman, a petroleum industry expert with more than 30 years of experience in the energy industry. Japan shuttered its nuclear power plants, but soon realized it had zero oil and gas resources. The Japanese decided to start importing liquefied natural gas — and the price shot through the roof (overseas LNG prices are indexed to crude oil prices; their decision to tap in to LNG came at a time when crude prices were exceptionally high). Demand for LNG grew — and the U.S. wanted in. Companies saw an opportunity to turn LNG import terminals into export facilities, and applications began flooding in to build greenfield export terminals. Jordan Cove was one of these, forgoing its plan to build an LNG import terminal on Coos Bay's North Spit in February 2012. Instead, the company immediately started looking into building an export terminal. Today, Jordan Cove is projected to export 0.9 billion cubic feet of LNG per day to east Asian markets. Althoff said one of Jordan Cove's advantages is its relatively short shipping distance to the Tokyo harbor: nine days. "Net LNG exports, primarily to Asia, increase by 3.5 (trillion cubic feet per day) from 2012 to 2030, then remain flat through 2040," according to the EIA. "Prospects for future LNG exports are uncertain, depending on many factors that are difficult to anticipate." Other studies, including a detailed effort at the Bureau of Economic Geology at the University of Texas, suggest the nation's four major shale gas plays will peak in 2020, and then drop off. The EIA and BEG provide different outlooks on the future of LNG — different, not conflicting, they noted in responses to "The Fracking Fallacy" in Nature last year. "...we both consider future scenarios and perform sensitivity analyses to show how variations in input parameters affect production outlooks," the BEG wrote in response to the Nature article. "The EIA result is, in fact, one possible outcome of our model." Berman worries that BEG's conservative estimates will come true. David Hughes, a geoscientist and Post Carbon Institute fellow, conducted a similar study and came out with results close to BEG's, saying that productivity has plateaued in most of the major shale gas plays. “If you believe there's any possibility that David and the bureau (BEG) are right, then we're screwed,” Berman said. He worries that the ever-changing industry will be a completely different animal by the time U.S. LNG export facilities get all of their required permits and are built, which in total can take several years for each project. Only one is expected to be operational by 2016: Cheniere LNG. It's already been nearly two years since Jordan Cove submitted its application to build an export terminal, and even if it gets FERC's go-ahead later this year and a slew of other permits after that, officials expect it will take around four years to build. But Althoff said several factors make Jordan Cove more appealing to the biggest buyers than other proposed facilities. "We know we can build this plant competitively with any plant being built in the world. I'm not worried about it going forward," he said. "It's in a great location and a lot of the infrastructure is already built out with the long-haul pipes out of Canada and the Rockies. Coos Bay is a great harbor and it's close to the market. "That's why this plant will get built and a lot won't. It's just in the right place at the right time. It also comes online in the right time; buyers are looking to buy product in 2019 and 2020." Althoff is confident other LNG export terminals won't get built, because they've just started working through the permitting process and because most would source their natural gas from the United States' four major shale gas plays: Marcellus, Haynesville, Barnett and Fayetteville. Jordan Cove, on the other hand, will receive natural gas from minor plays in Colorado and Canada, which Althoff said buyers don't see as a huge risk. The EIA predicts shale gas production will continue to increase as hydraulic fracturing — or fracking — techniques continue to evolve, which would lead to a larger natural gas supply, which would then lead to increased exports of natural gas and LNG. Prices for LNG in Japan are typically always higher than the U.S. Henry Hub. In 2013, Japan sat at around $16 per million British thermal units, compared to less than $4 Btu stateside. There are currently 14 U.S. LNG export terminals proposed to FERC, which total 15.4 bcf of LNG per day. They have to jump through a lot of regulatory hoops to even begin construction. They cost a lot to get permitted and built, presenting a financial risk for sponsors (Veresen has already committed millions of dollars to permitting and expects Jordan Cove and the Pacific Connector Gas Pipeline will cost $7.5 billion to be built). These projects typically require 20- or 25-year contracts in order to break even with high investment and construction costs. Liquefaction plants and LNG trains take years to build, during which time any number of things could have shifted in the LNG industry and regulatory processes. The industry's future is hazy and unpredictable, making investment risky when projected demand, competition and prices are not concrete. Internationally, Berman said “there's more than enough natural gas to meet Asia and Europe's need for a couple of decades. Opposition has been strong in the Bay Area, and it worries "boosters" (Boost Southwest Oregon members) like Rick Skinner. Skinner, who's also the president of the Bay Area Chamber of Commerce, expressed his concerns at the South Coast Community Foundation meeting Wednesday. "We need more support — better support," he told the room of local government officials and educators. "The opposition is still loud, they're still there and they're still vocal. It's the same 23 people at all the meetings — but they're very vocal." Comments opposing Jordan Cove and the Pacific Connector Gas Pipeline have flooded the projects' dockets at FERC. The number of comments in support of the projects is small in comparison. "I've been talking to Jordan Cove's CEO and his biggest thing he's afraid of is this project dying because of a thousand slashes," Skinner said. Althoff brushed off dismal reports of LNG's future. "This has been our lot in life, I think," he said. "Everyone thinks this was always the project that wasn't going to go. Usually when we look at those reports, then talk to the analyst, we're able to fill in some gaps they're not all that aware of." Althoff echoed comments EIA administrator Adam Sieminski made earlier this week at a Washington, D.C., meeting, that companies are planning for 20 years from now, not today or tomorrow. "It's not surprising that as crude prices drop everyone is worried about these projects, but it's a growing market, buyers are looking a long ways out and the advantaged projects are going to get built," Althoff said. International buyers also like U.S. LNG export terminals' tolling agreement structure, he said, rather than linking LNG to a constantly fluctuating market. The issue, Energy Intelligence wrote, is that with several LNG export terminals likely to come online in the next decade, gas giants are hesitating to open avenues to LNG due to possible excess supply. “Four are all but guaranteed to go ahead, and two more are likely — and these six front-runners alone would add more than 70 million tons per year to global LNG supply by late this decade or early next,” Energy Intelligence wrote. Those six "front-runners" are Sabine Pass LNG trains 1-4 in Louisiana, Cameron LNG in Louisiana, Freeport LNG in Texas, Cove Point in Maryland, Corpus Christi LNG in Texas and Sabine Pass trains 5 and 6. "I read the studies. They're interesting, but I usually find some flaws," Althoff said. "I've seen 30 studies on LNG projects globally. Ours will rank from no chance to ... a number of reports today put us in the next two to three to be built globally. It depends on the report and who's writing it." So, what if the EIA is right, and the nation's natural gas supply continues to grow and support several new LNG export terminals? What if it's wrong, and FERC's growing list of LNG projects — including Jordan Cove — are destined to fail?